Moist. 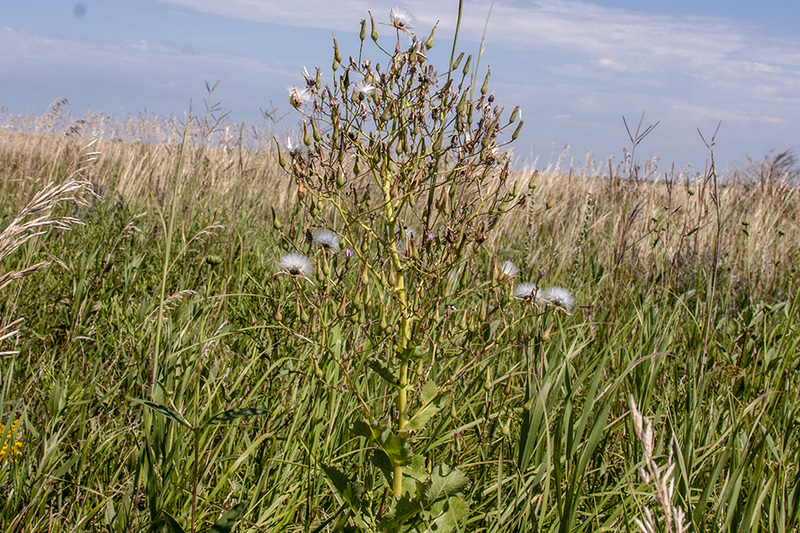 Prairies, meadows, wood openings, streambanks, open places. Full or partial sun. Pale yellow or, occasionally, light blue, bluish-white with yellow tips, or pale lilac. This is an erect biennial or, possibly, a short-lived perennial, with a thick, deep taproot. 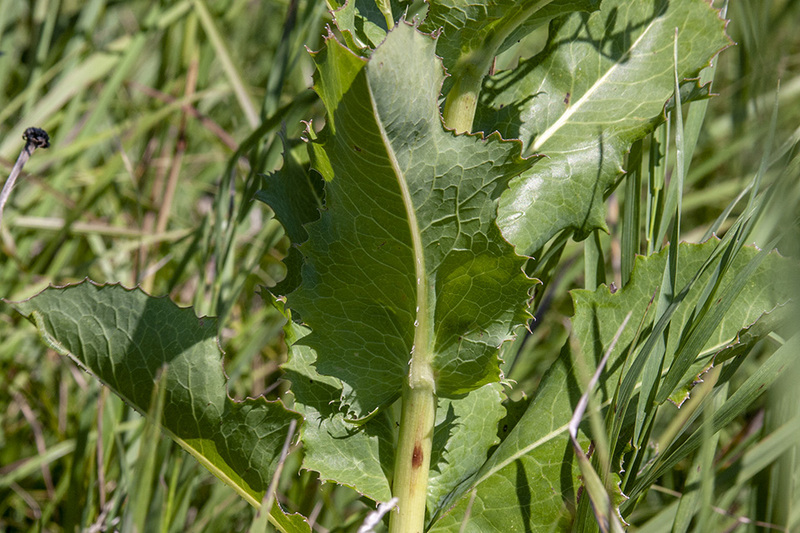 The stems and leaves contain a brownish, milky latex. 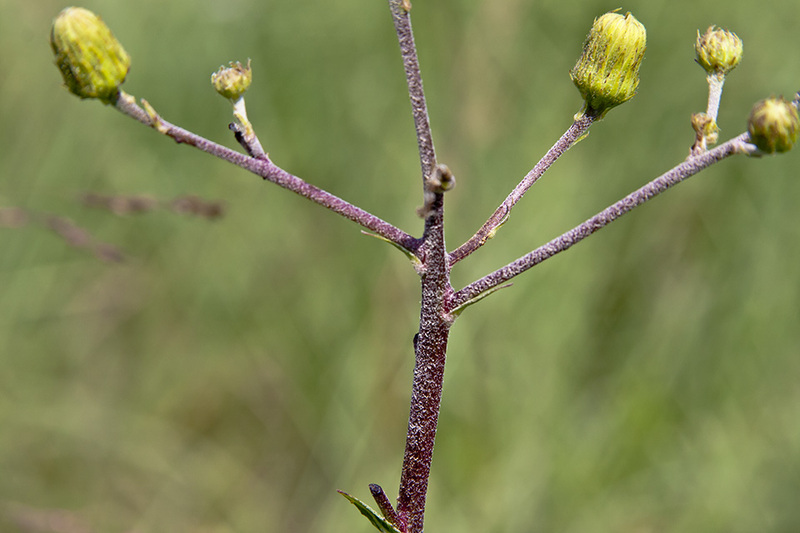 The stems are usually unbranched except in the inflorescence. 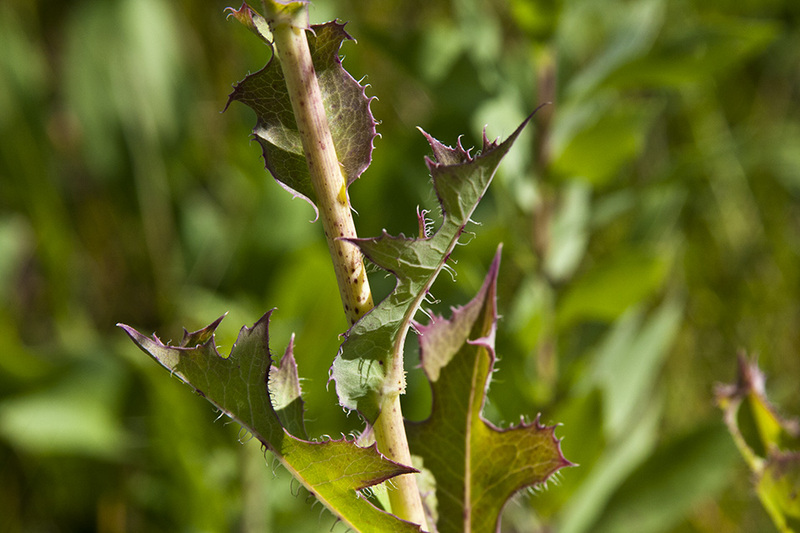 They are leafy and hairless, often with prickles near the bottom. 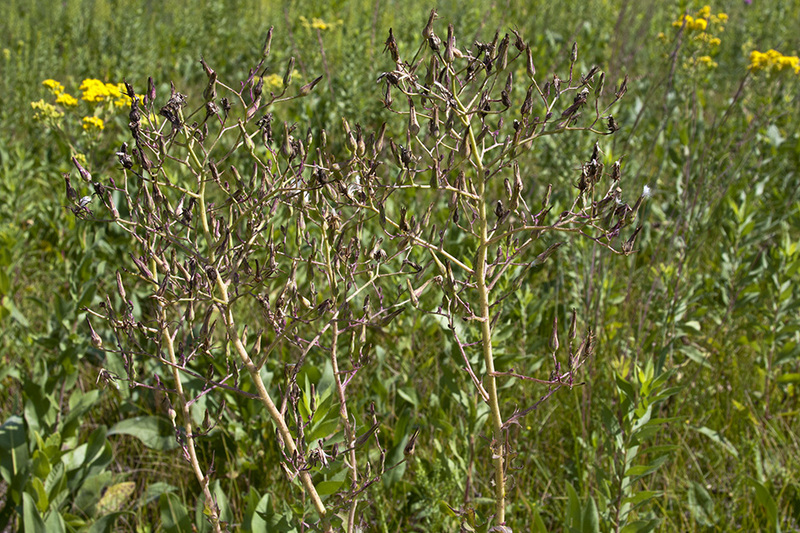 The leaves are alternate, stemless, bluish, and usually lobed. 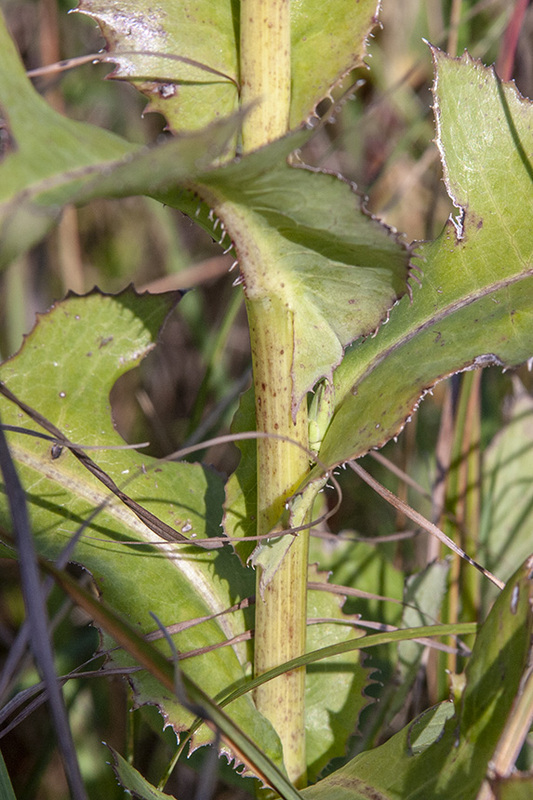 They are 8″ to 12″ long and 2″ to 4″ wide, becoming smaller as they ascend the stems. They are hairless but have weak (easily bent) prickles on the leaf margin. 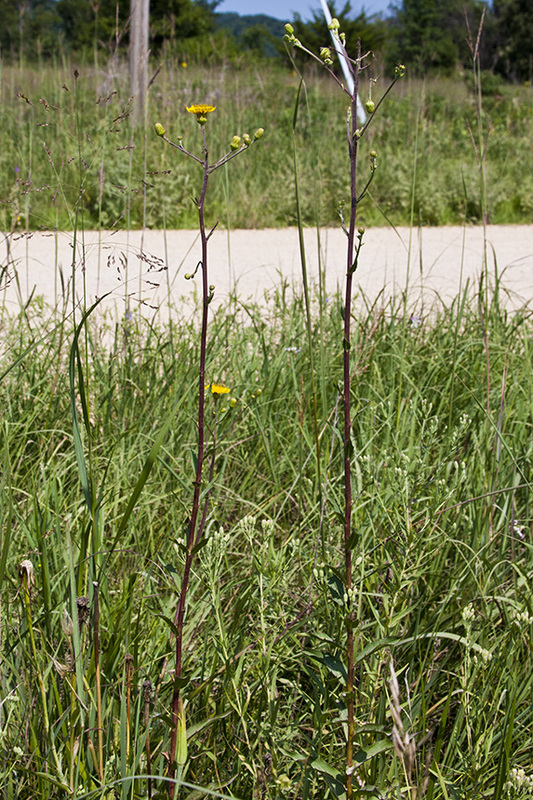 They are attached at the base without a leaf stalk (sessile). 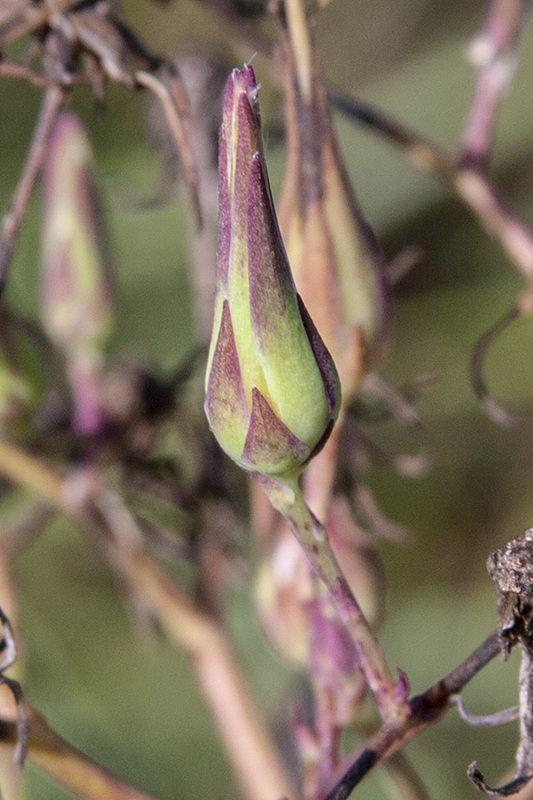 Sometimes, the basal lobes partly surround the stem (clasping). 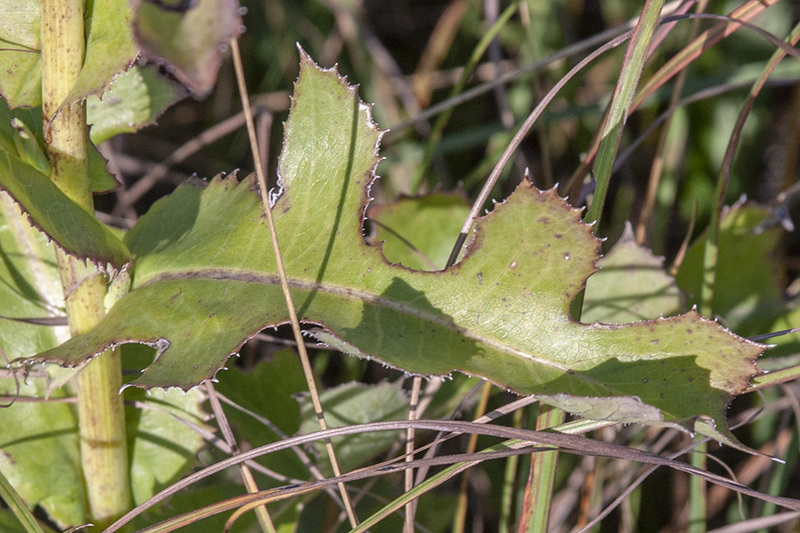 The midvein on the underside also has prickles. The inflorescence is a long, spreading, cone-shaped, loosely-branched cluster. 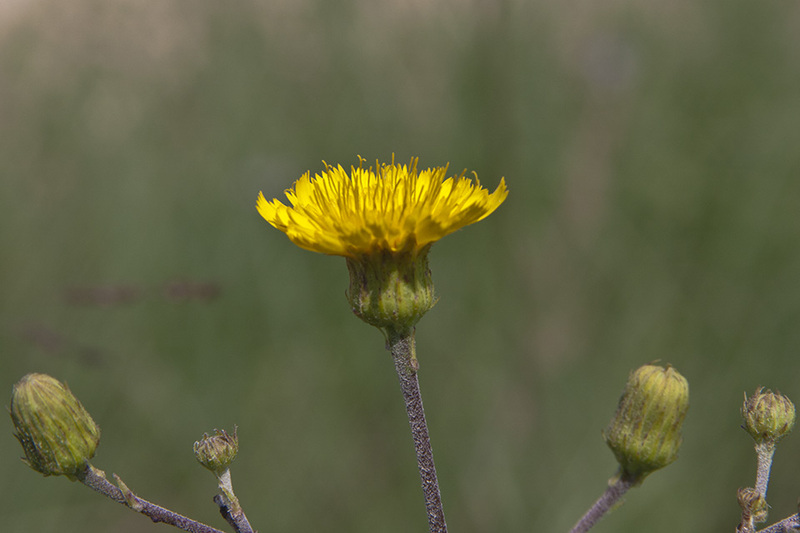 The flower heads are from ¾″ to 1″ across and have 20 to 56 ray florets. The rays are pale yellow or, occasionally, light blue, bluish-white with yellow tips, or pale lilac. They have truncated tips with 5 small teeth. There are no disk florets. The flowers are open for only a brief time in the morning. 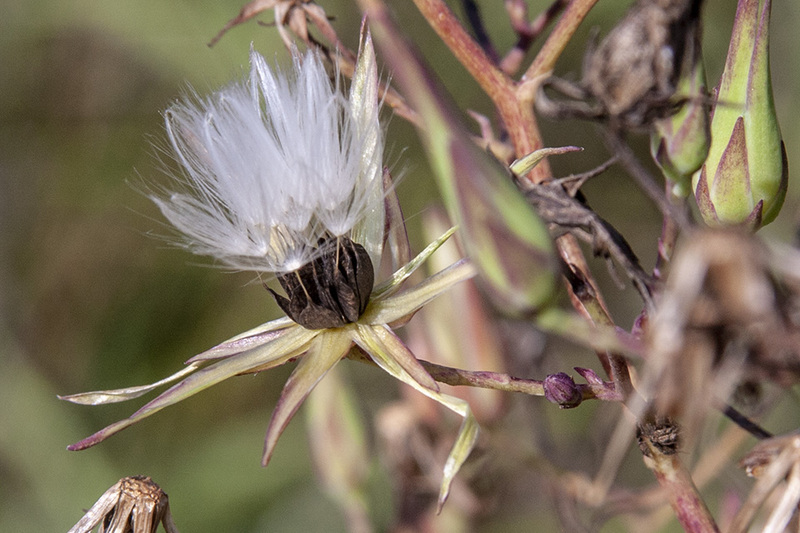 The fruit is a brown to blackish achene with fluffy, white bristles attached to the tip. 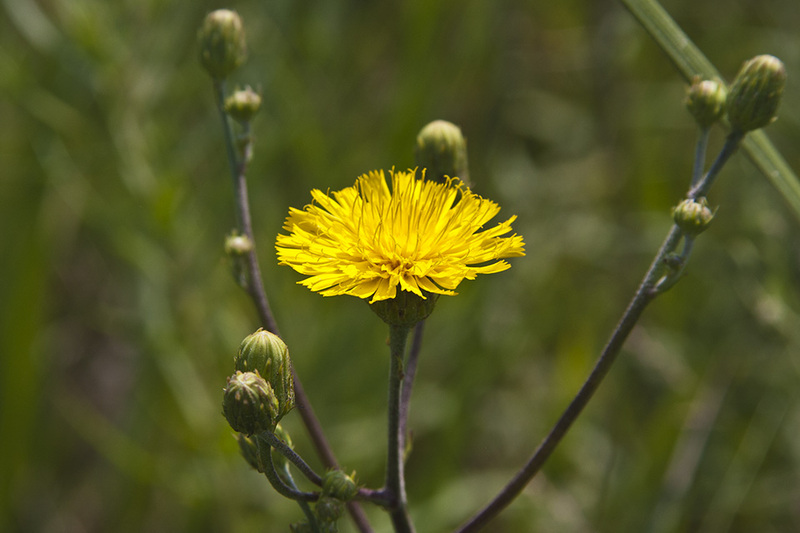 Canada lettuce (Lactuca canadensis) has yellow flowers. 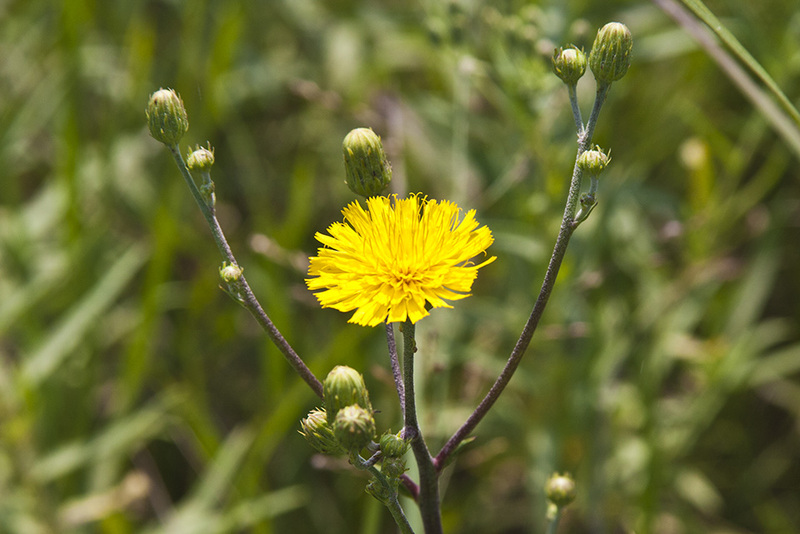 The flower heads are about ⅜″ across and have 13 to 22 ray florets. 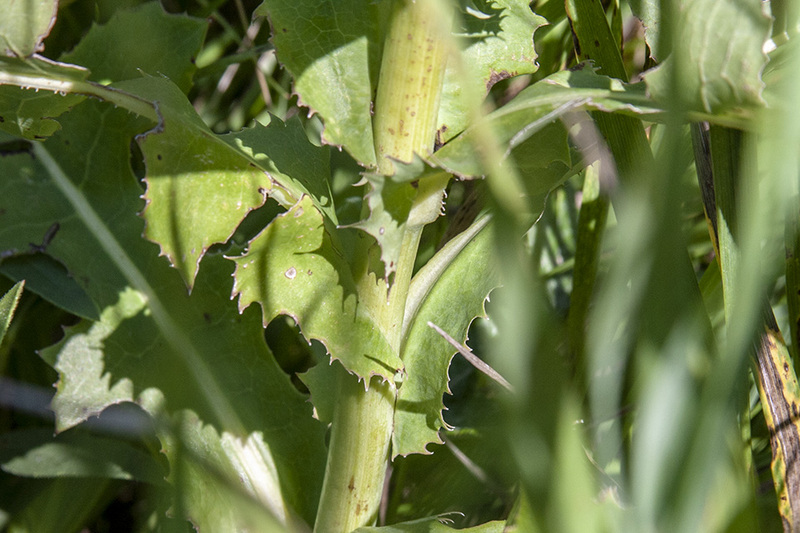 Prickly lettuce (Lactuca serriola) has yellow flowers. 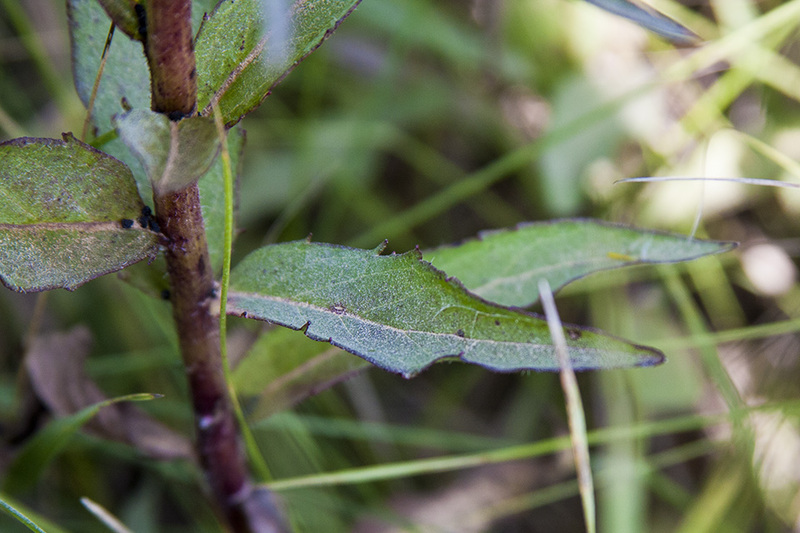 Some of the leaves are often more or less perpendicular to the ground. 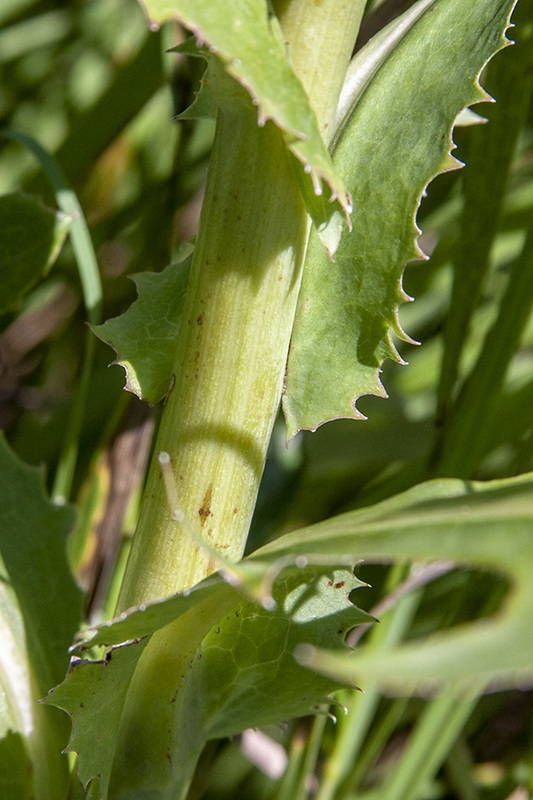 They have prickles on the margins and stiff sharp prickels on the underside of the midvein. 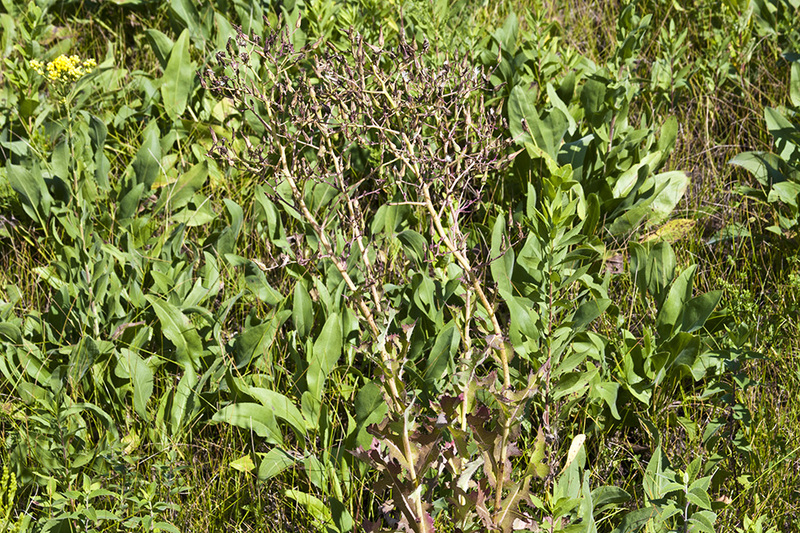 Showy blue lettuce (Lactuca tatarica ssp. pulchella) has blue flowers. The leaves are unlobed or with narrow lobes. 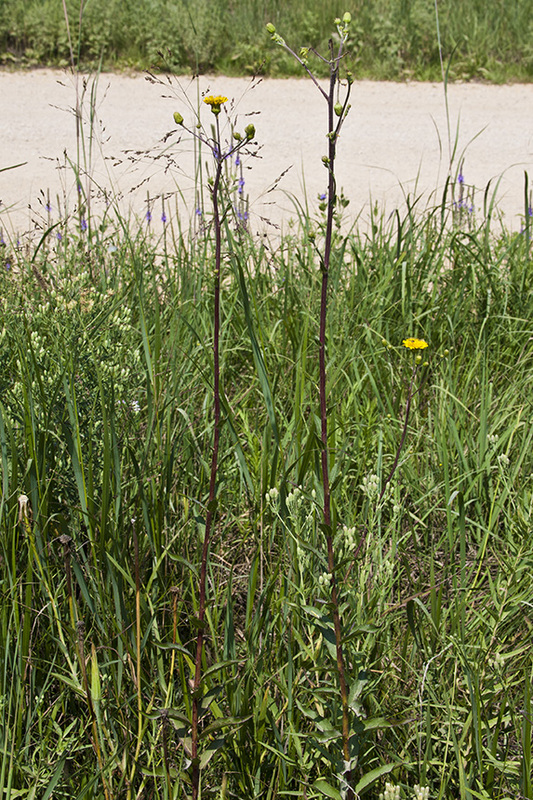 Tall blue lettuce (Lactuca biennis) has bluish to white flowers. The flower heads are about ⅜″ across. The achene has grayish-brown bristles attached to the tip. 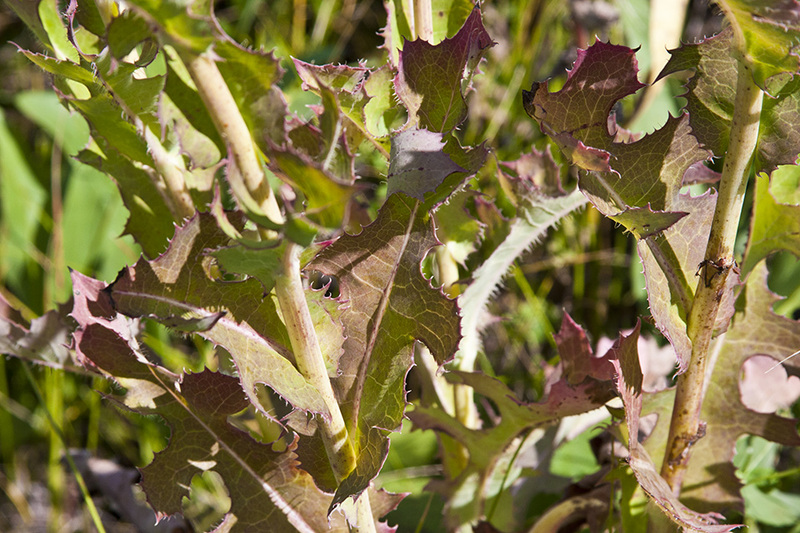 Woodland lettuce (Lactuca floridana var. 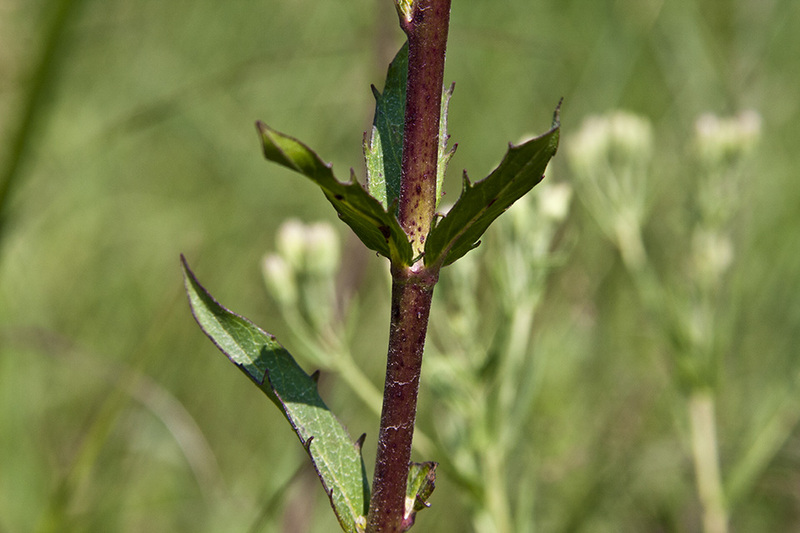 floridana) has leaves on leaf stalks. 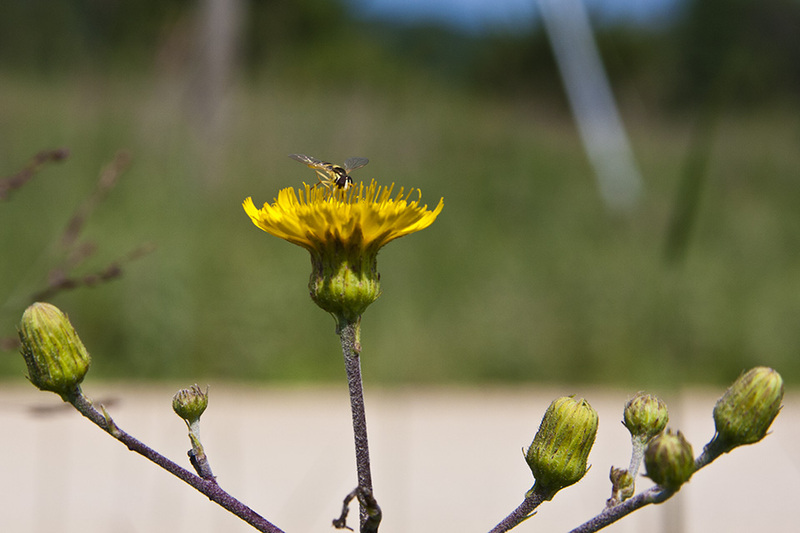 The flower heads are about ⅜″ across and have 11 to 17 ray florets. Stalkless; attached at the base without a petiole, peduncle, pedicel, or stalk.